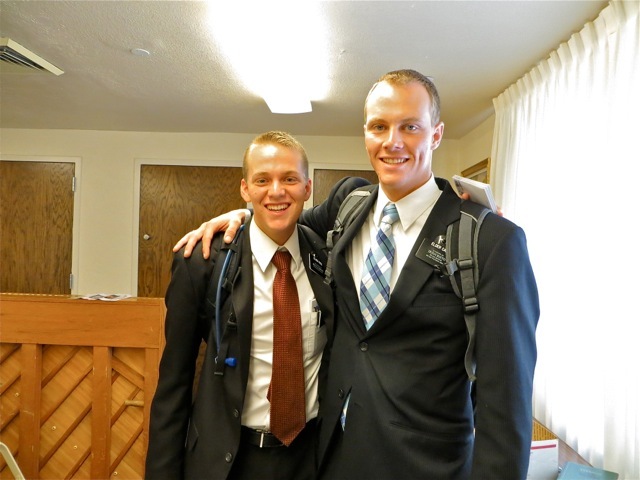 Months ago we told Elder Beard and Fitts that we would drive them to the temple but things came up that did not make it practical to do that so we told them we would come down early on transfer morning and see them off to the temple. Hear are some of the pictures we took at 5:30 in the morning. 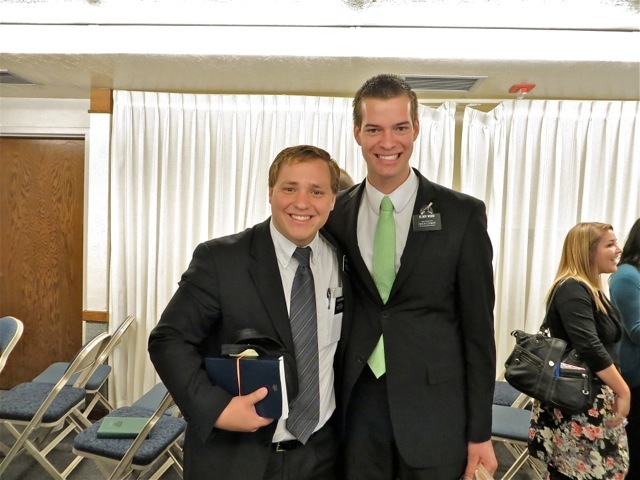 Elder Plowman – who has served with elder Beard as Zone Leaders up in Palm Beach for the last couple of transfers – with elders Beard and Larsen. 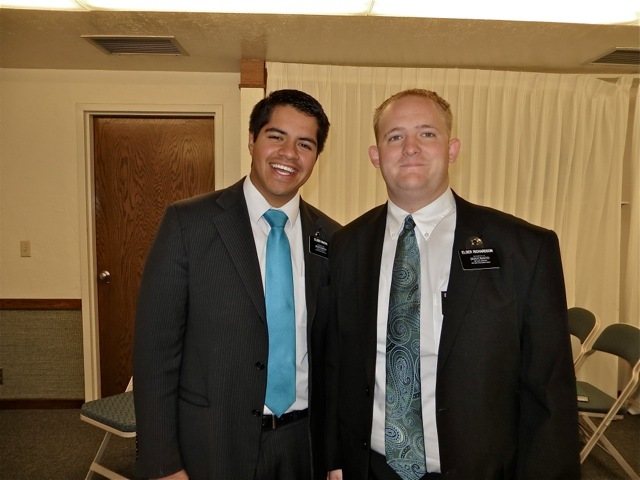 Elder Larsen has been district leader here in Fort Lauderdale for a number of transfers so we got to know him well. 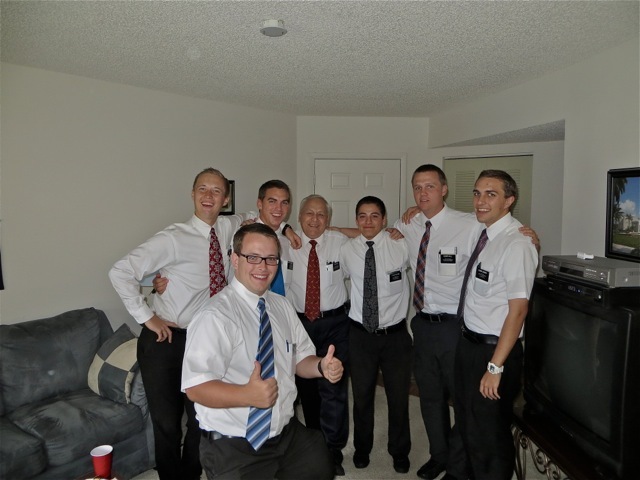 The last picture is of Elders Larsen, Fitts and Beard celebrating their approaching release date. I am sure this was the first time they were the least bit trunky. 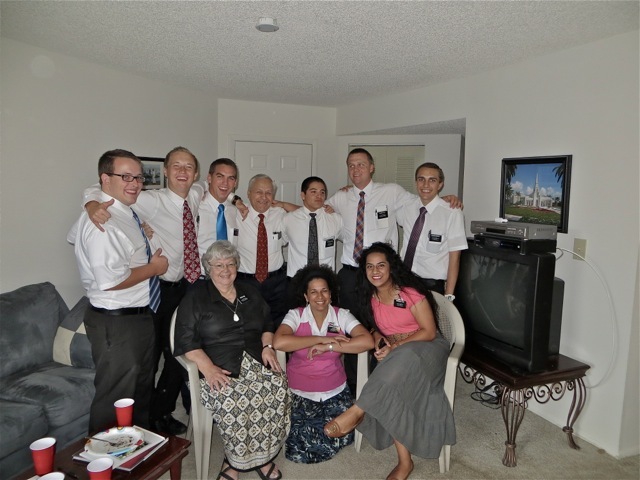 A last picture of Elders Plowman and Beard and sister Hancock and Keyworth. 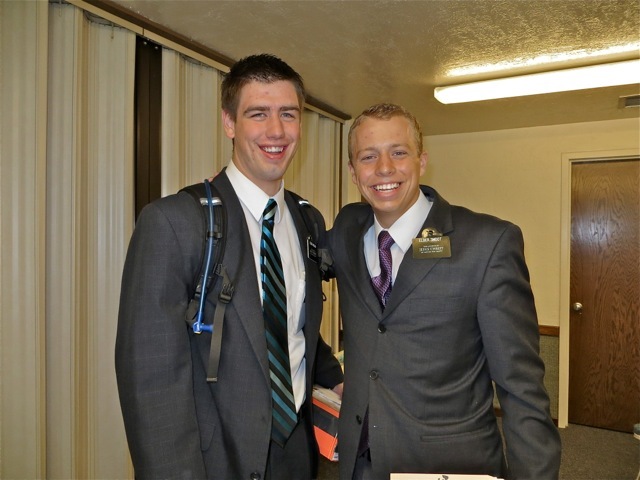 We say goodbye to three great missionaries who we became close to while we served together. 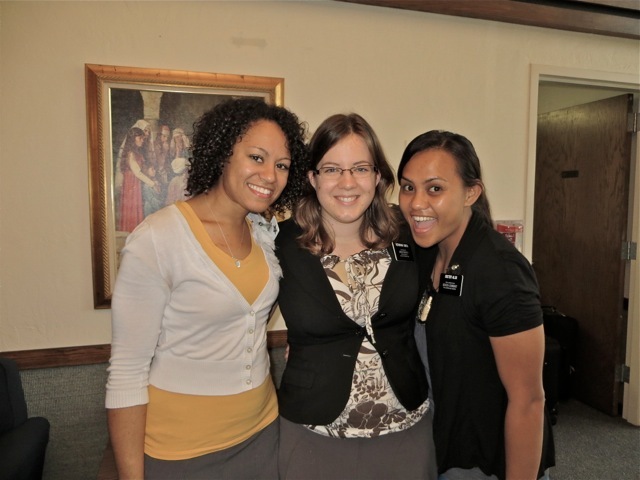 In the evening when we went over to the Mission Home to meet elder Fitts’ family, I got this picture of Sisters Nielsen, Hancock and Keyworth who spent their last night in the mission at the Mission Home while the elders went off to La Quinta for the evening. 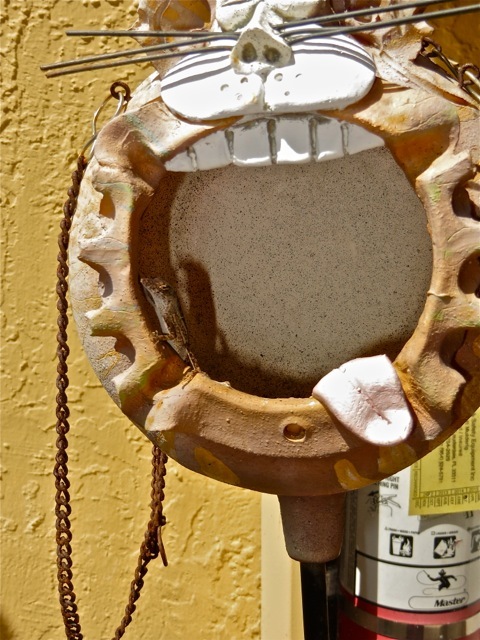 This entry was posted in Fort Lauderdale Mission on October 27, 2012 by Bill. 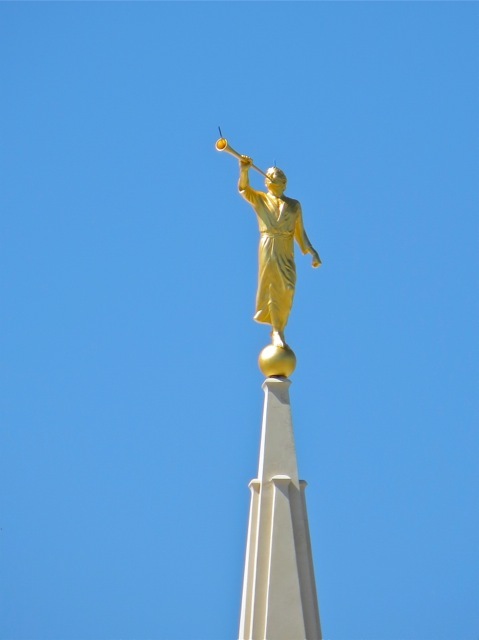 On one of the most beautiful days of our mission we had the opportunity to go by the temple site early and get some great pictures. 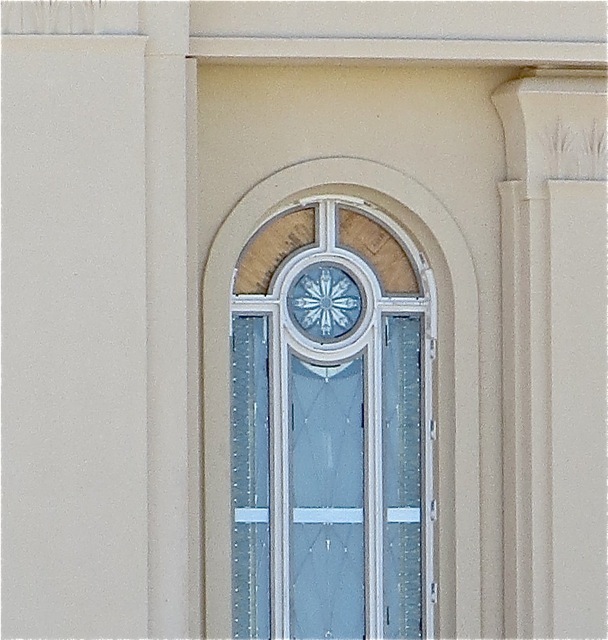 These three are of the East side or entrance side of the temple. 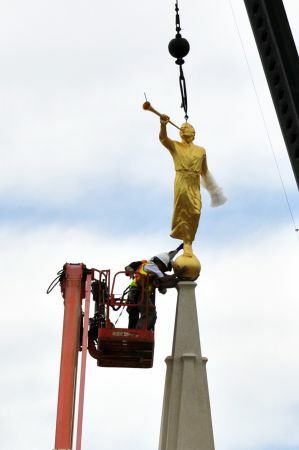 Moroni was put up on Wednesday and although we were not there to see it be installed we did get to see a video that President Anderson made of the event. 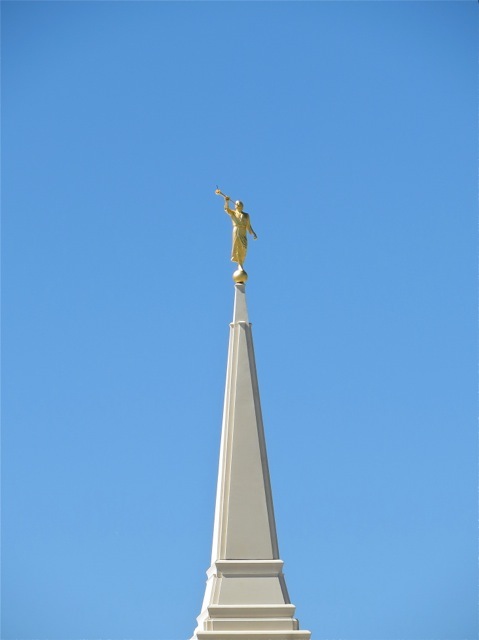 These three pictures are of the North side of the temple. We found out that it will not be long before all the big equipment will be removed and they will start doing the preparation for landscaping. I was happy to see that one on of the windows was at least mostly installed. Each piece of glass is installed individually after the frame is in place. 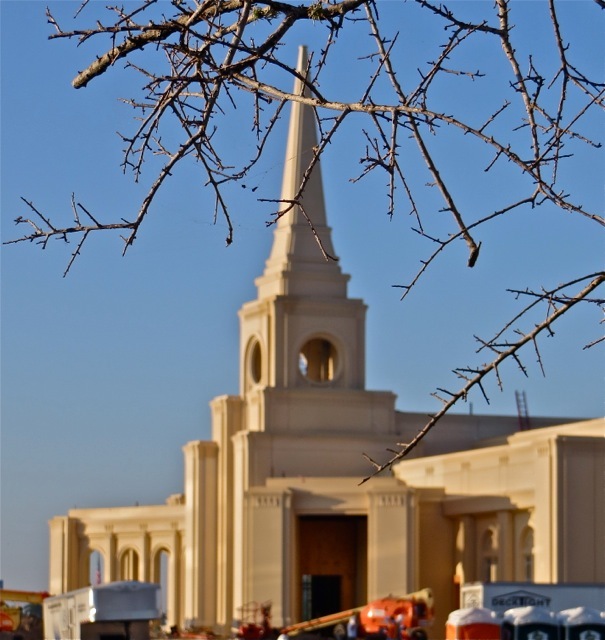 If you look closely you can see the beautiful details that will be beautiful to look at from inside or out side of the temple. 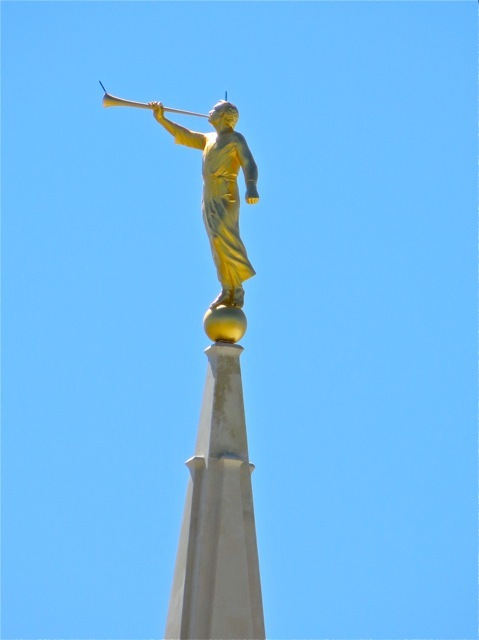 If you look closely at the picture of Moroni you can see the two lightening rods that are to protect the temple from a strike. 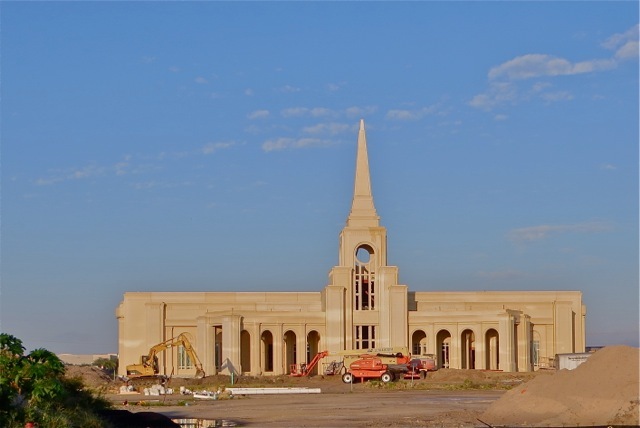 By the time we leave in late April the temple should be getting close to being completed – we hope at least the landscaping will be all done. Now we just have to decide if we can come back for the dedication. Transfer day is always busy and long. Today it was a little longer and busier for us because we wanted to be at the chapel to say goodbye to the missionaries who were going to the temple and then going home on Thursday. 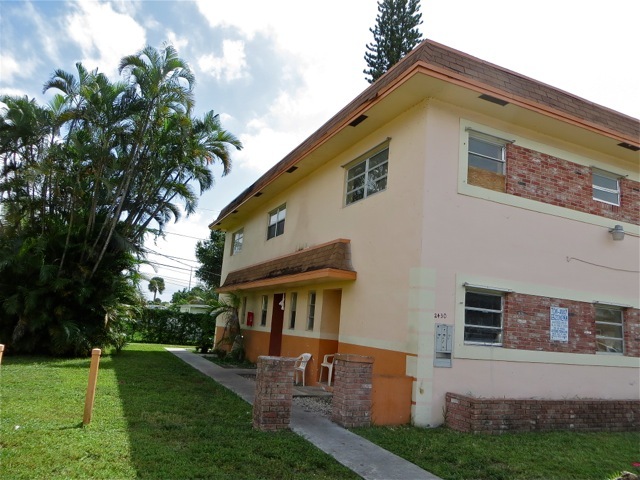 We especially wanted to say goodbye to Elders Fitts, Larsen and Beard who we had the great opportunity to work closely with when they served here in the Fort Lauderdale area. 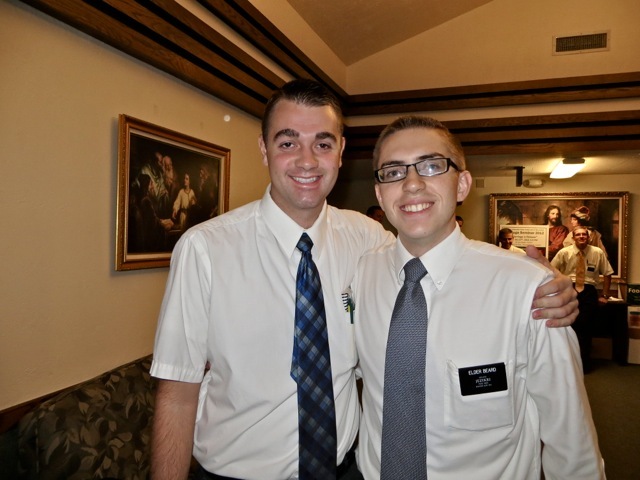 Elder Toeava is now serving with elder Grant in Jupiter South. 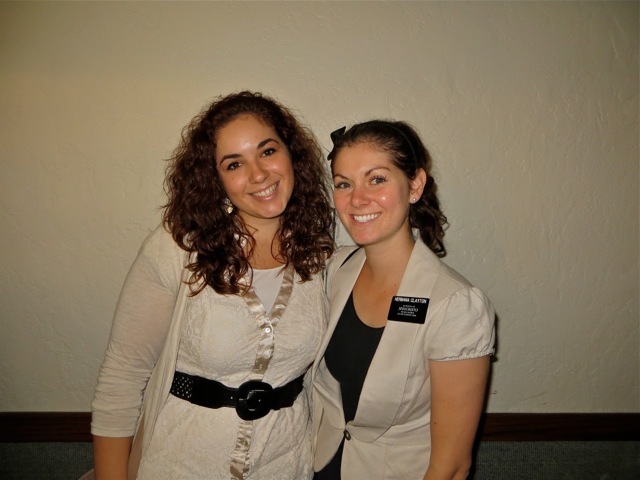 Sisters Carnes and Clayton are serving in Hialeah East. 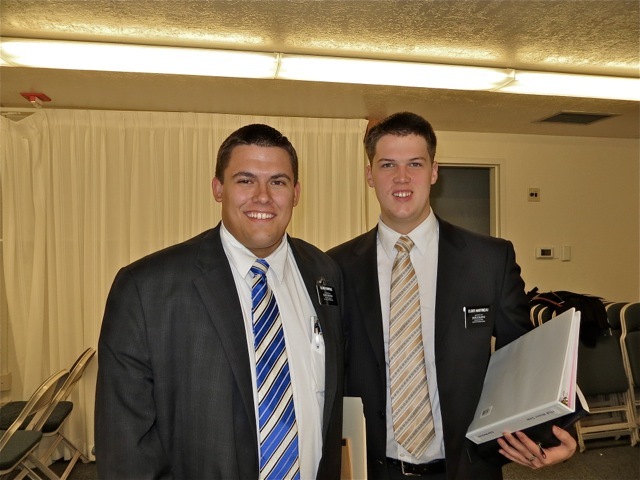 Elder Dowdle is training elder Martineau in Homestead East. 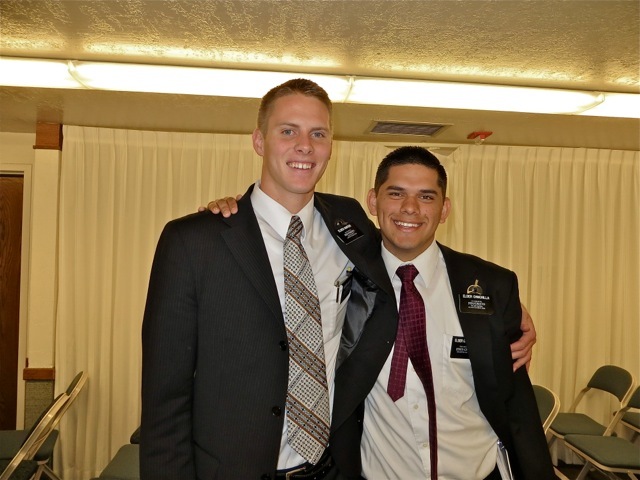 Elder Diaz will train elder Ovard in Riverside North. 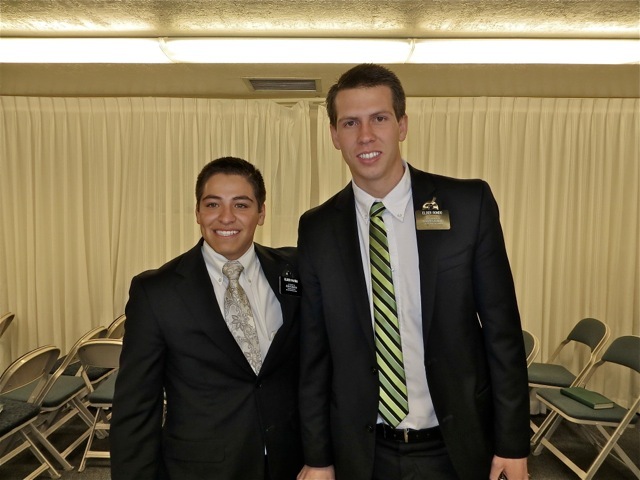 Elder Hunter will be trained by elder Chinchilla in Fountainbleau. 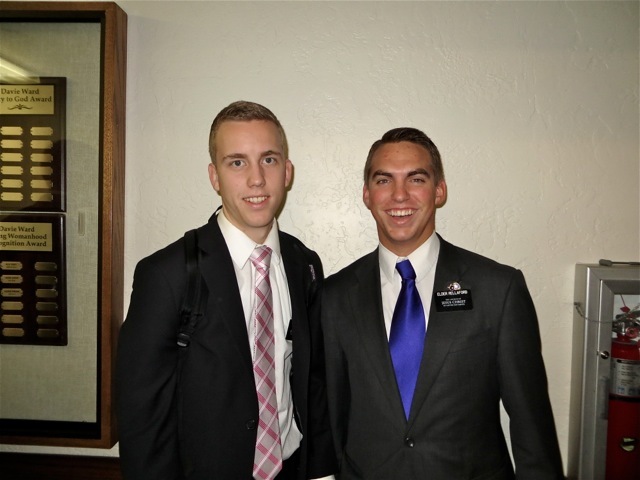 Elder H Taylor will be trained by elder Rellaford in Fort Lauderdale so we will have a good opportunity to get to know him. Elders Patino and Rondo will serve in Fort Lauderdale East. 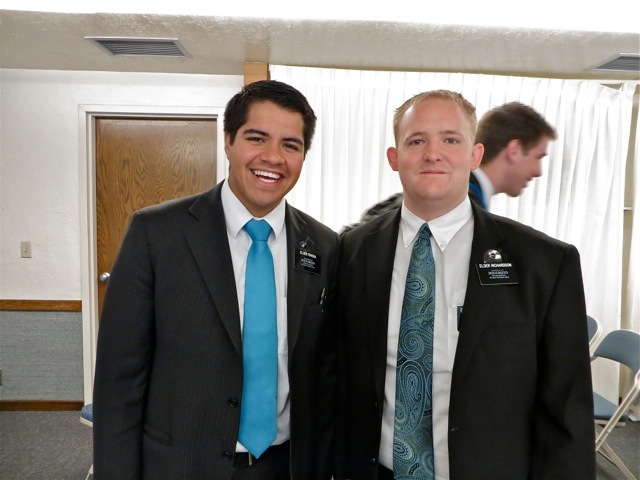 Elder Rivera will train elder Richardson in West Palm Central. 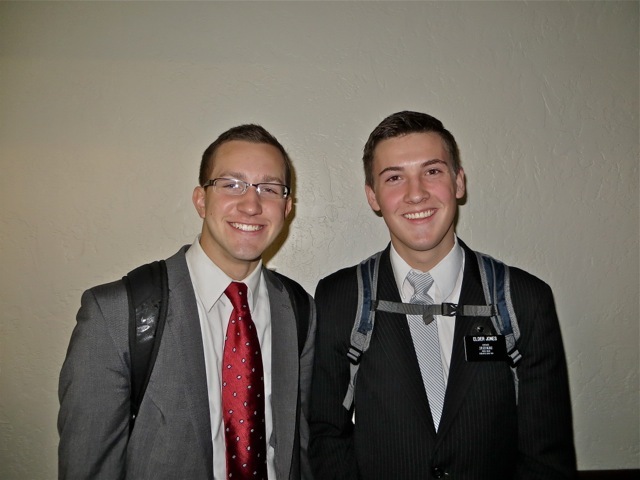 Elder Brockbank will be training with elder K Jones in the Coconut Creek Creole area. 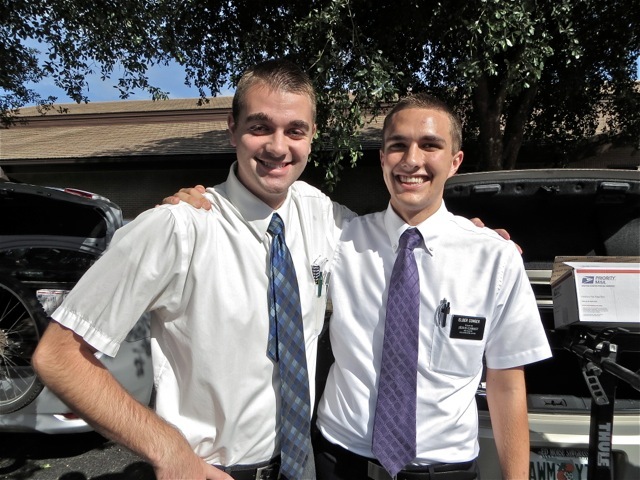 Elders Free and Call will be serving in the Plantation area. 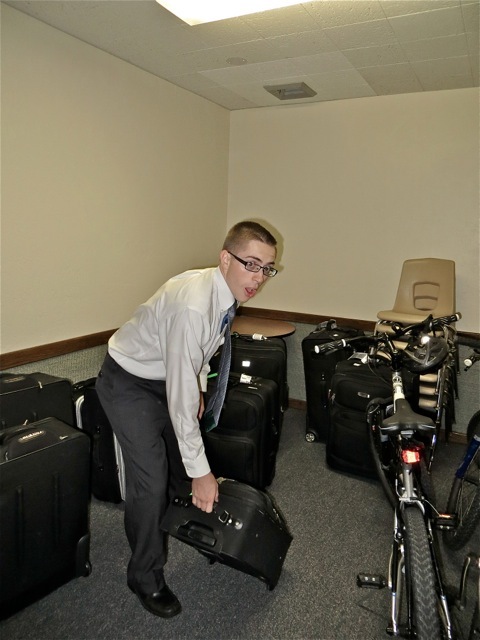 We lost elder Harral to the Fort Pierce area where he will serve with elder Furner. There is now a trio of sisters serving in Coral Springs area – Holder, Smith and Aloi. 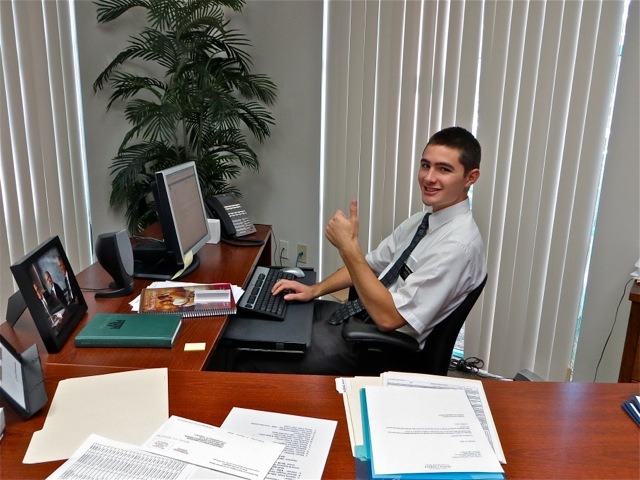 Elder Hoole will be training elder Turek in the Miami Shores Creole area. Elders Lee and Pond will be serving the Cypress Creek area. 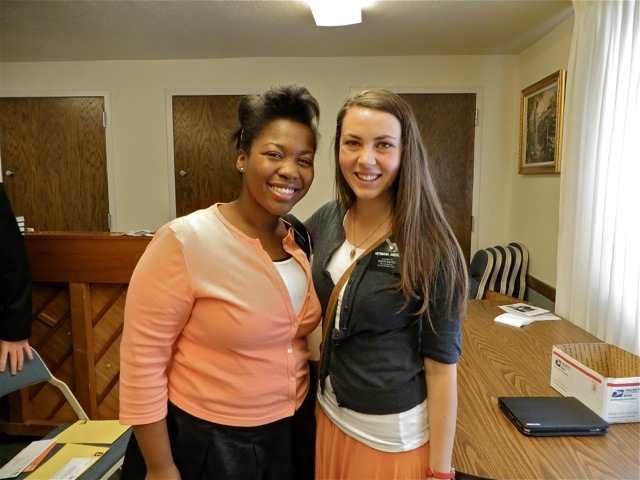 Elders Meredith and Palacio will be serving in Belle Glade. Sisters Packard and Beck will serve in Boynton Beach South. 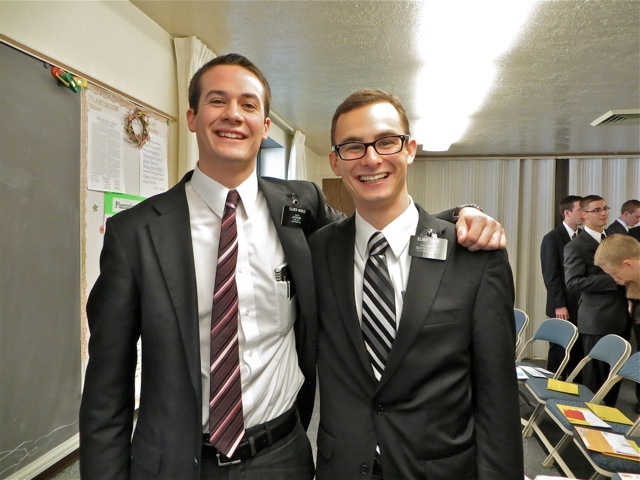 Elders Pearce and Maddox will be in Wellington. Our dear friends elders Plowman and Conger will serve together in Palm Beach South as Zone Leaders. 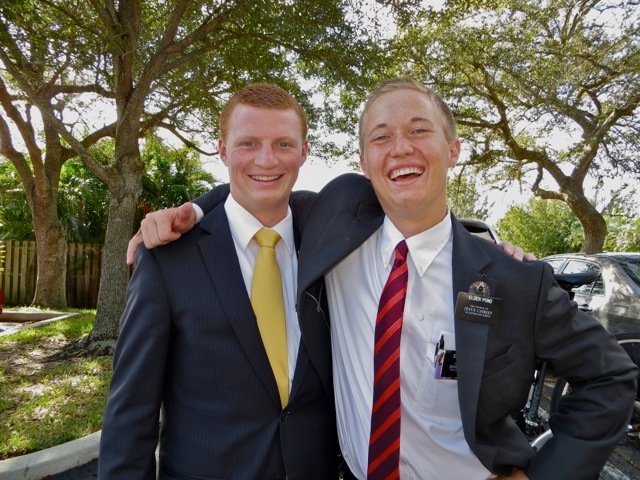 Elders Rasmussen and Nielsen are now in Coconut Creek North. 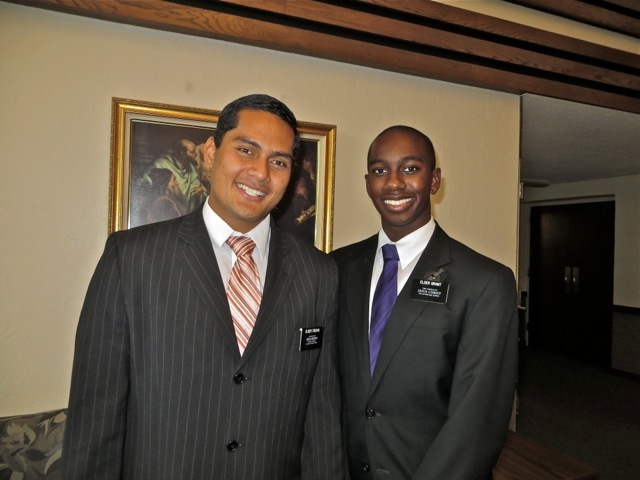 Elder Rivera will train elder Richardson in West Palm Central – second shot! 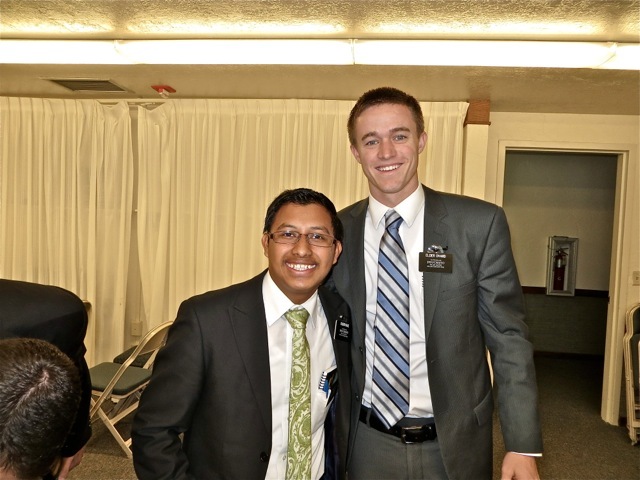 Elder Samuelian will be elder Benitez’ companion in North Miami Beach. 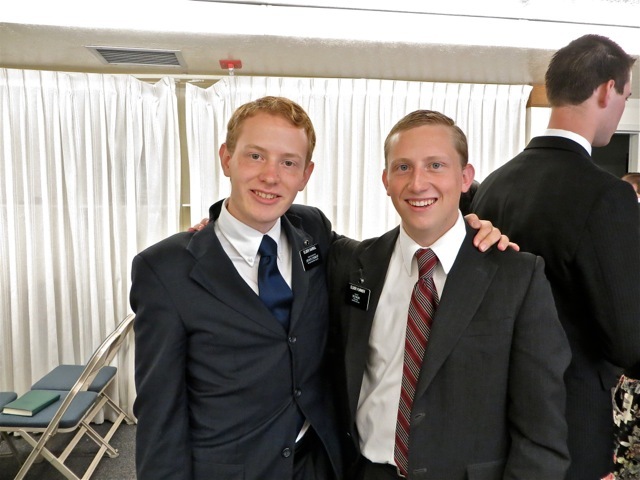 Elder Shaffer has a new companion elder C Wood and will continue to serve in the Pines area as DL. 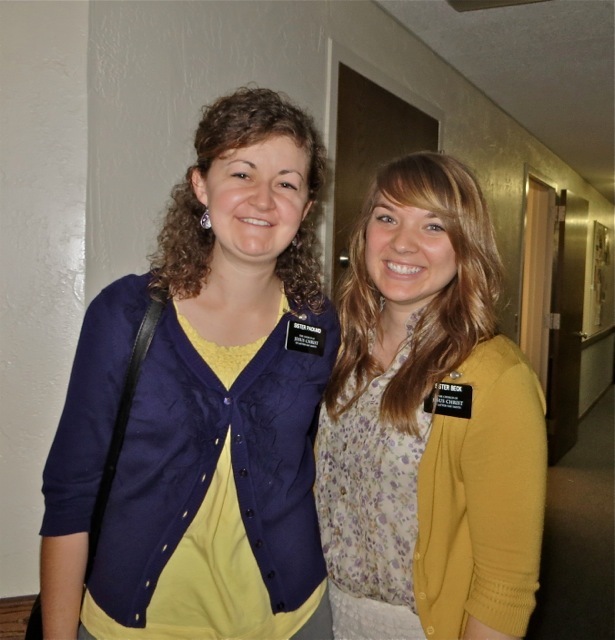 Sisters Chavous and Andrus are now serving in the Snapper Creek YSA. 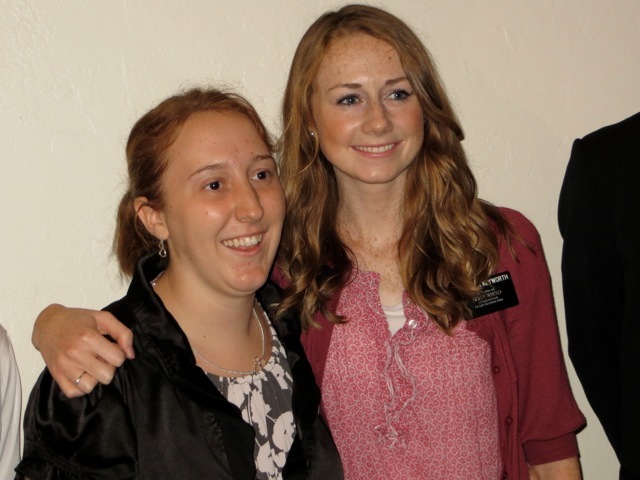 Sisters Johnson and Holyan will serve in the Nova YSA. Sisters Quiocho and Bagley are serving in Miami Shores. 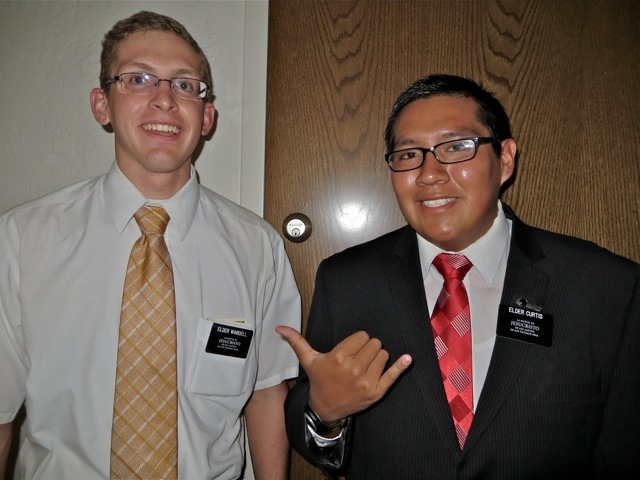 Elders Wardell and Curtis will serve together in Blue Lagoon East. 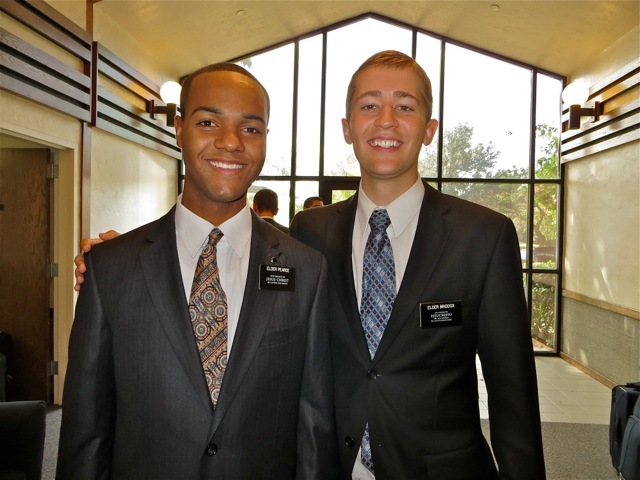 Two old friends, Elders Wilson and Smoot, will serve together in Boca Raton. 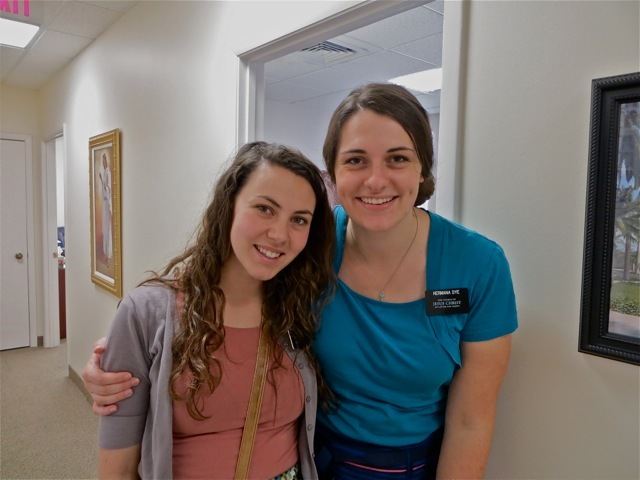 When the group left for the temple this morning Sister Smith was left as the only sister at the chapel with lots of elders and that is not allowed. So we brought her home, gave her some breakfast and then she had a couple of hours of personal study time. 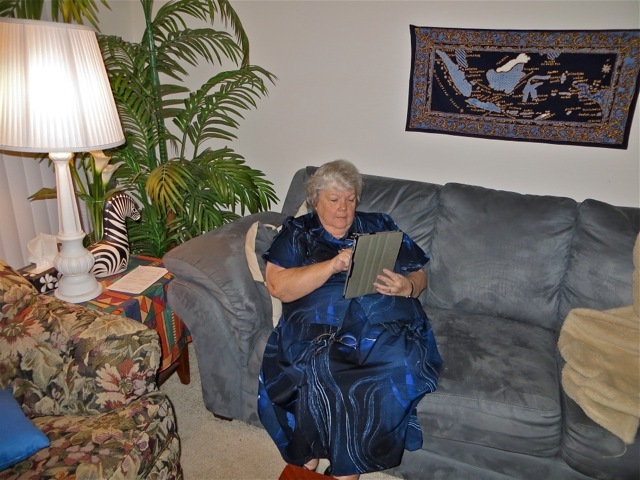 Mary took advantage of the down time to use her iPad. After the transfer meeting there is a special meeting for new missionaries and their trainers. 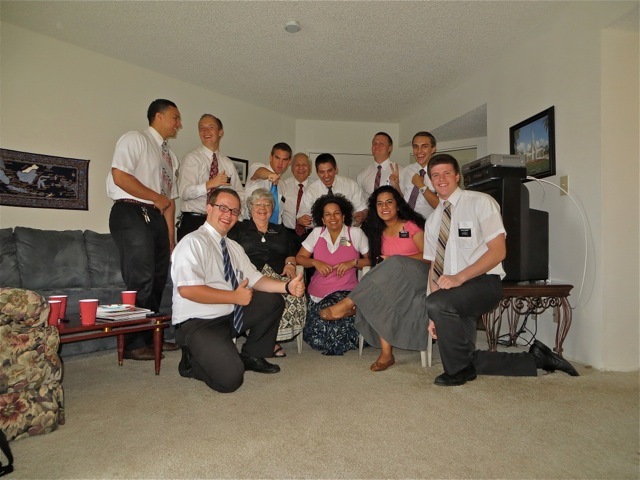 Other missionaries who are riding in cars with the those attending the latter meeting gather together and just enjoy talking to each other. After the meeting lunch is served. We volunteered to stay and help with lunch – I am becoming an expert at heating up Angus cheeseburgers – so we got to eat with them and then help clean up. One of the great thing about having all these elders around is that there are plenty of hands to put up and take down tables and chairs. After office hours we went to the Mission Home to have the President sign some letters and to take him the money for the missionaries luggage expenses. 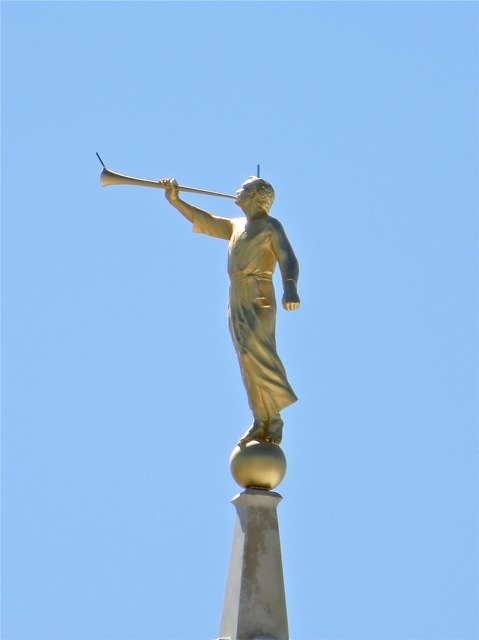 When we got there he told us that the Angel Moroni was put on the temple earlier that day and brother Barry invited them to watch. 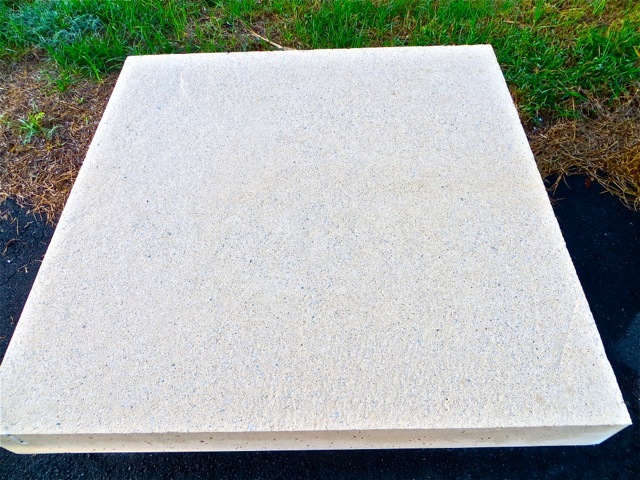 He showed us a video of the process and later I took these pictures by president Acevedo off a website. 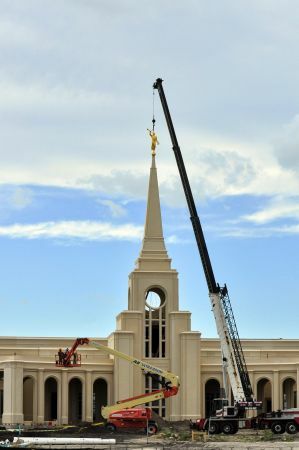 Moroni is made of fiberglass and has two lightening rods built in. They are grounded all the way down to the earth. 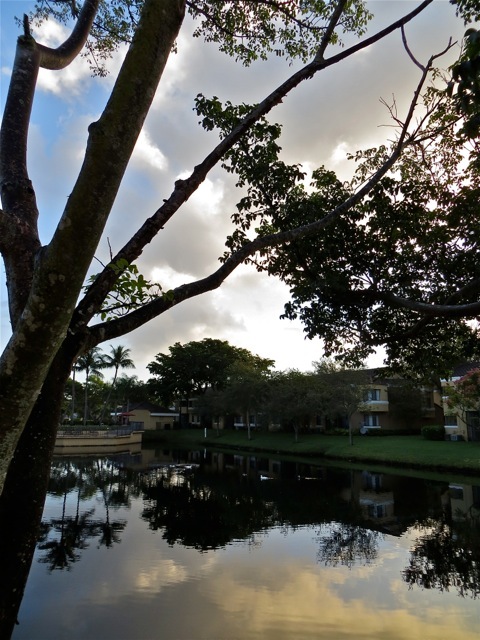 This entry was posted in Fort Lauderdale Mission on October 25, 2012 by Bill. We had another of our traditional Last Lunches on the Tuesday before transfers. We invited the Fort Lauderdale district and the zone leaders over. We tried to fill them up with hot roast beef dip sandwiches, green salad, steak fries and Costco chocolate cake for dessert. We know it was a successful lunch because some of them did not even have room for the cake! 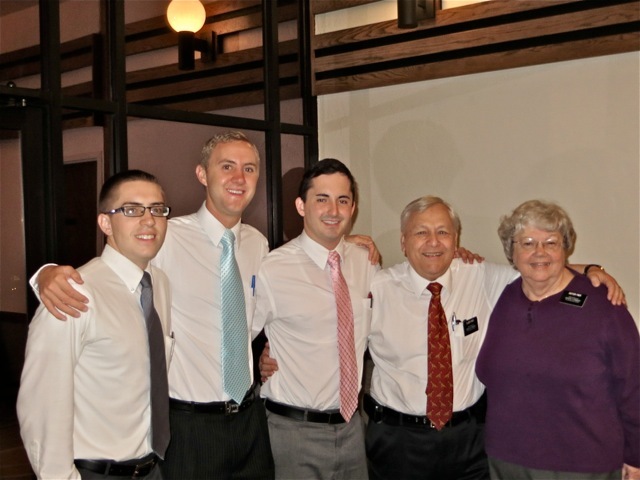 The district – Elders Doman, Pond, Rellaford, Pier, Patino, Hall, Conger. Sisters Pier, Escorbores, Tuai. In the middle we add the ZLs – Elders HoChing on the left and Bishop on the right. Sisters Escorbores, Pier and Tuai make a lovely picture. 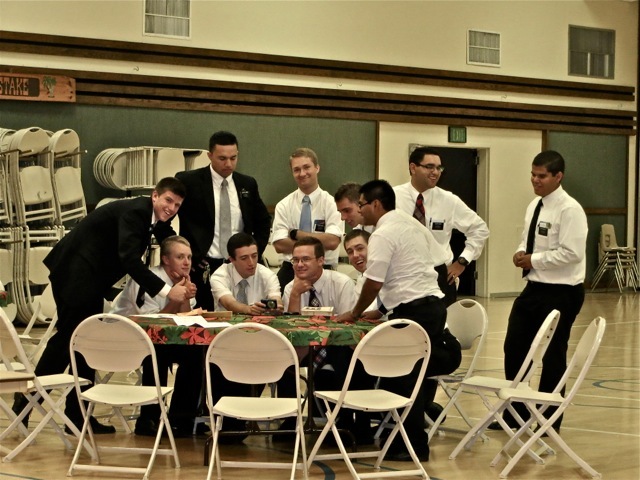 In the middle sisters Pier and Tuai share the table with elder Pond and Hall. Elders Pond, Hall, Bishop and HoChing with Sister Escorbores caught with a forkful heading for her mouth. Elders Doman, Rellaford and Bishop sharing a moment together. 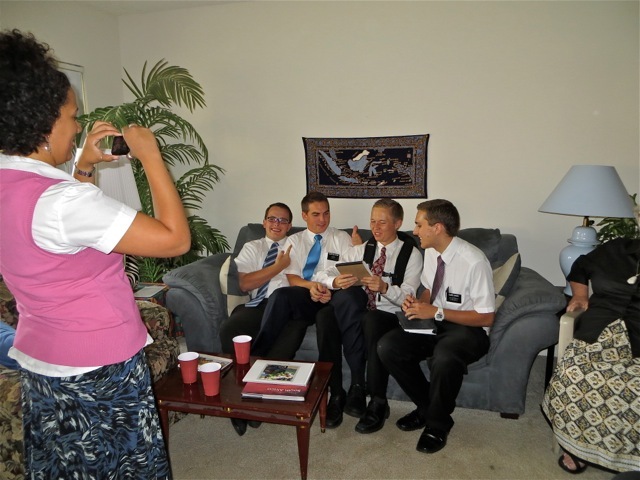 Sister Escorbores takes a picture of Elders Doman, Rellaford, Pond and Conger. This great district has been bringing more souls unto Christ in a month than some Zones – than some missions in the US! 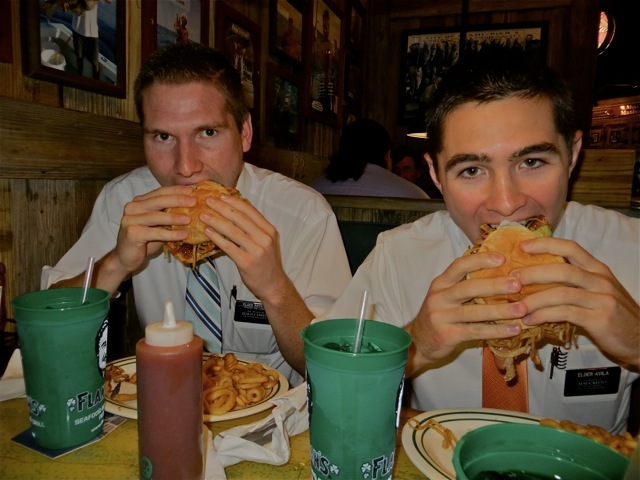 They have great faith, they are strictly obedient, and work hard – they are above average missionaries. I think the sign above Elder Pond says it all! 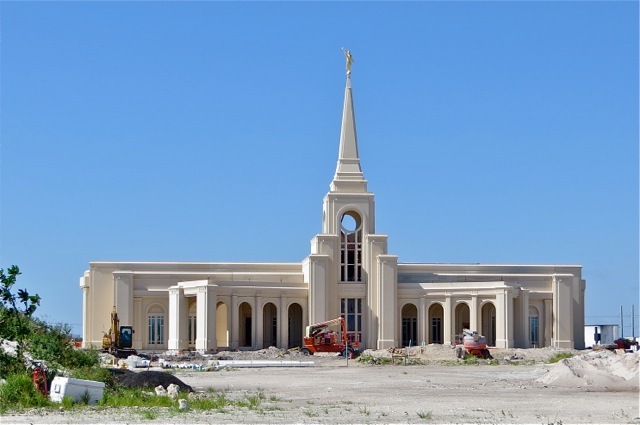 This entry was posted in Fort Lauderdale Mission on October 23, 2012 by Bill. Another Milestone for the Mission – Instruments in God’s Hands. President Anderson wrote this in his weekly letter to the missionaries. 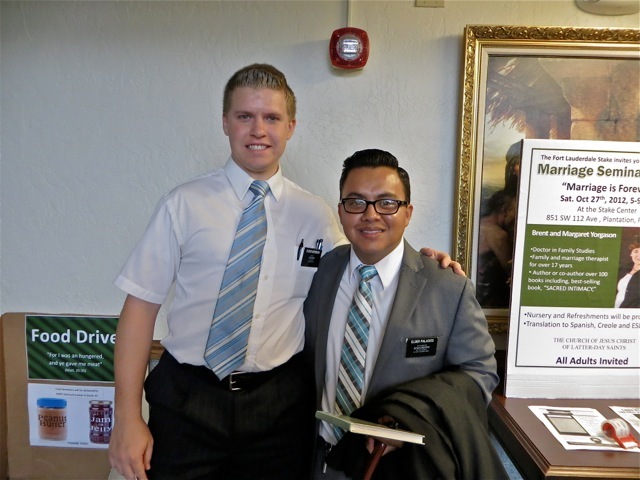 It reminds me that on Sunday during the Fort Lauderdale stake conference he had the 30 or so full time missionaries stand and repeat our purpose as found in Preach My Gospel. What a thrill it was to stand and join in with the amazing missionaries of the zone reminding ourselves and all present of why we are serving missions for the Lord. 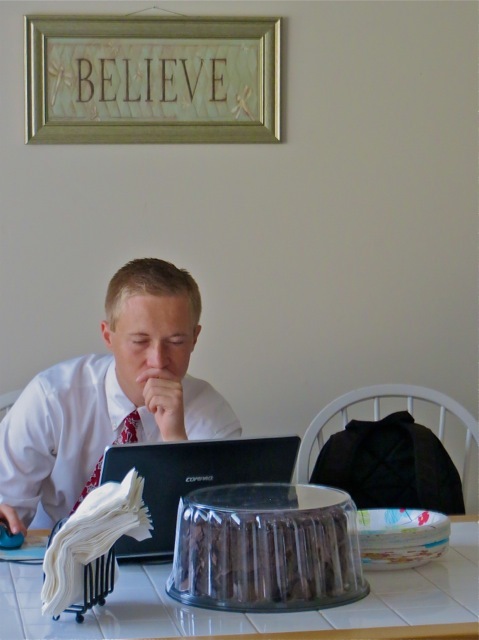 Just this morning I read in the Deseret News that missionary applications are up 471%. Before the announcement about the change in missionary ages there was an average of about 700 per week – it is now running about 4000 a week. Hopefully this will continue to be the average for months to come! 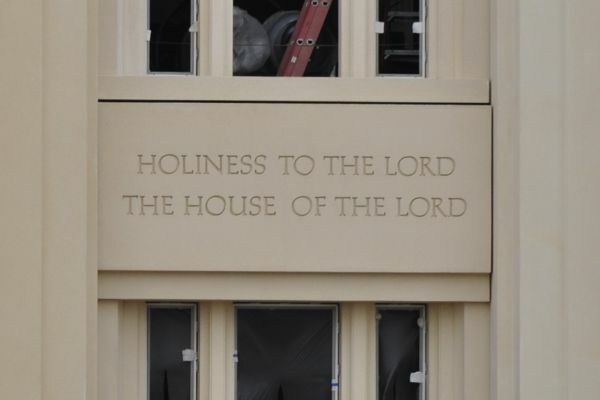 P-Day Visit to the Temple Site..
One of the things Mary really likes to do is to go by the Fort Lauderdale temple site and see what is new. 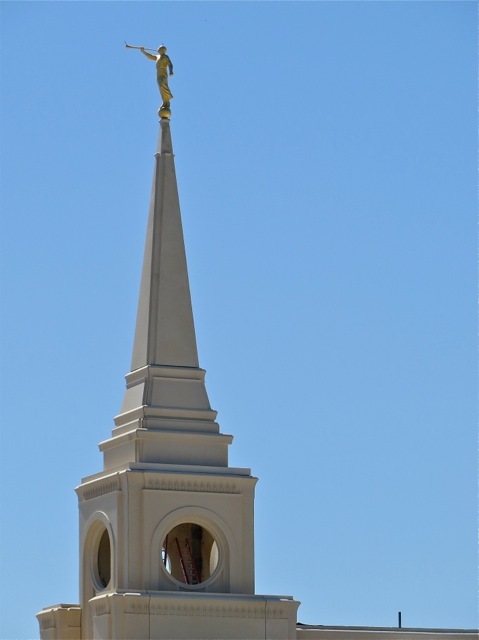 So this morning we got up and out of the house early…well for a P-day it was early and got the chance to see and take pictures of the temple with the steeple in place – now it just needs Moroni up there. 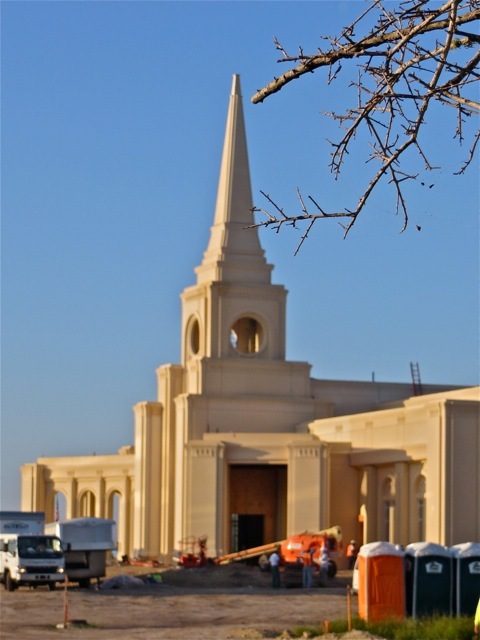 The front – East side – of the temple with the steeple. 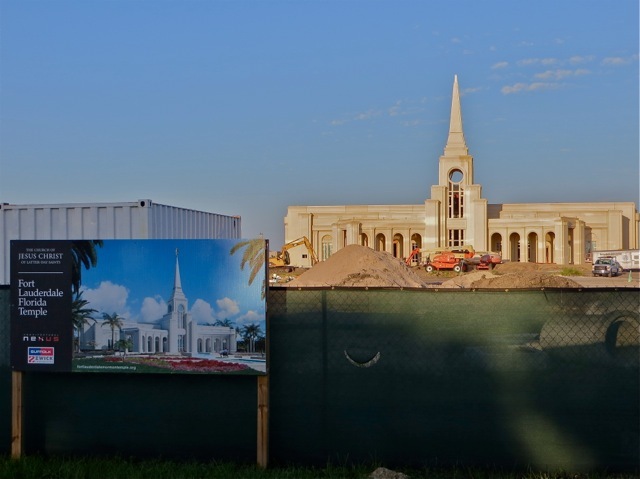 The first one includes the artist rendering which of course does not do justice to the actual temple. The right hand shot is of the West side as seen from the freeway with the sun rising behind it. If you look closely you can see the beautiful windows that are in place. 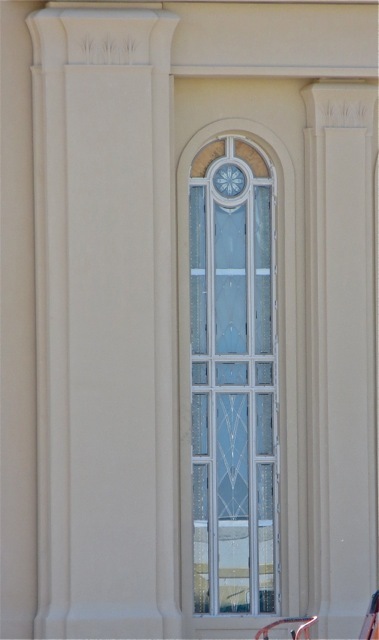 Brother Berry told us that there is decorative trim that will accent the windows even more. What a beautiful scene this will be at night with all the windows lighted. 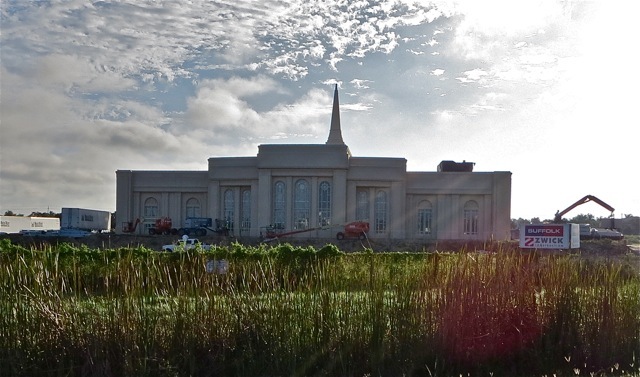 A couple of shots of the North side of the front of the temple. 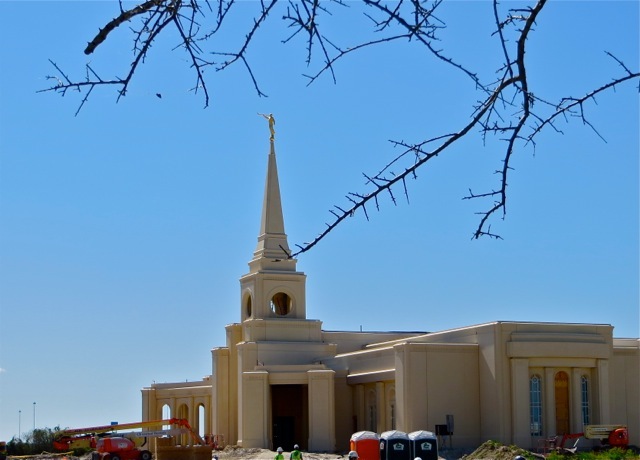 When the pre-cast stone that covers the temple is sealed it will be lighter and the small chips of blue and clear stone should sparkle. After visiting the temple we went to McDonalds for breakfast and then to the office where I had to do some things that I had forgot to do yesterday. 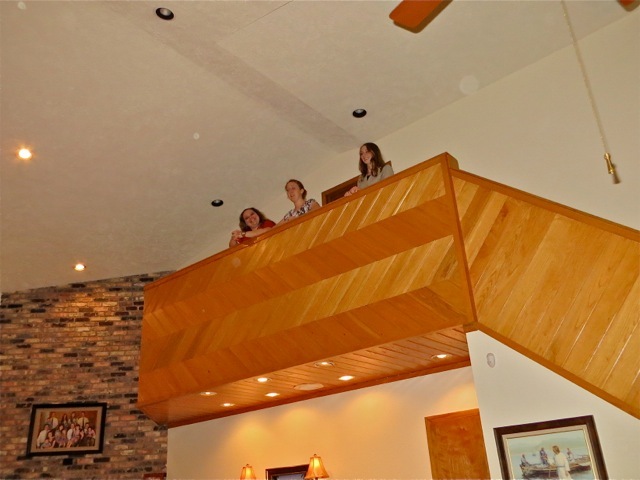 Later we will go out with Elders Pond and Hall to help teach an investigator and then it will be time to go to the evening session of Fort Lauderdale’s Stake Conference. 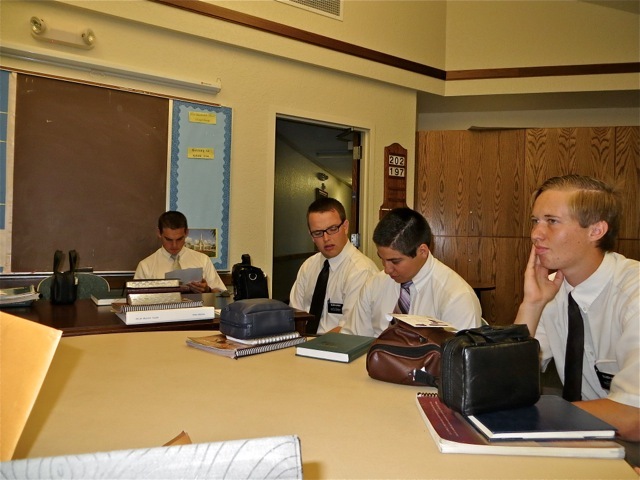 This entry was posted in Fort Lauderdale Mission on October 20, 2012 by Bill. The four sisters who live near the mission office and serve the wards in the area came by today to get some supplies they needed. 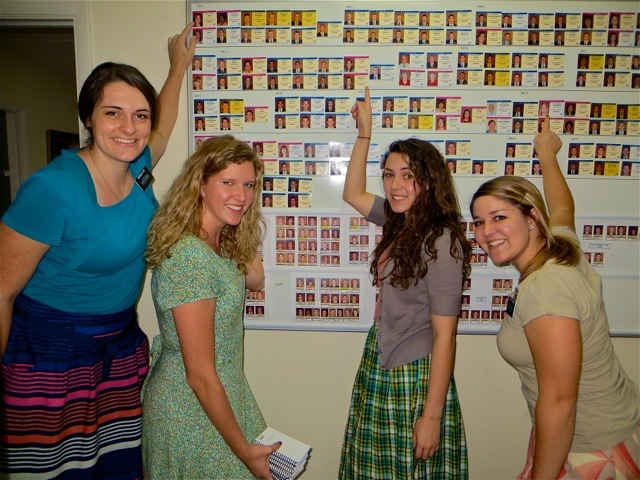 Earlier in the day I had to take down the pictures of the missionaries who are going home this transfer so we could put them in their departure packets. 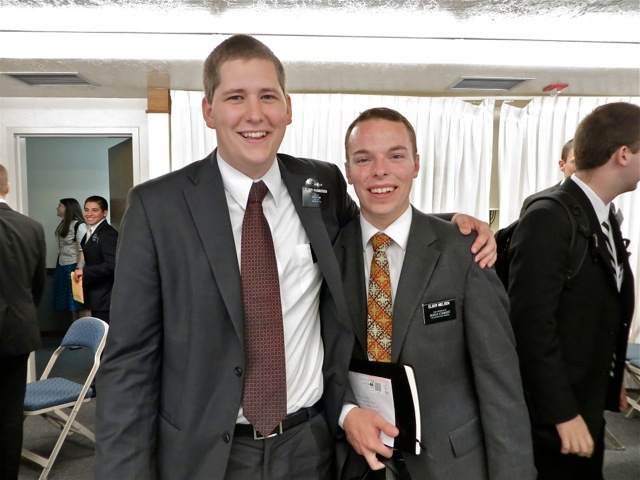 That means all the other missionaries needed to be moved up the board. 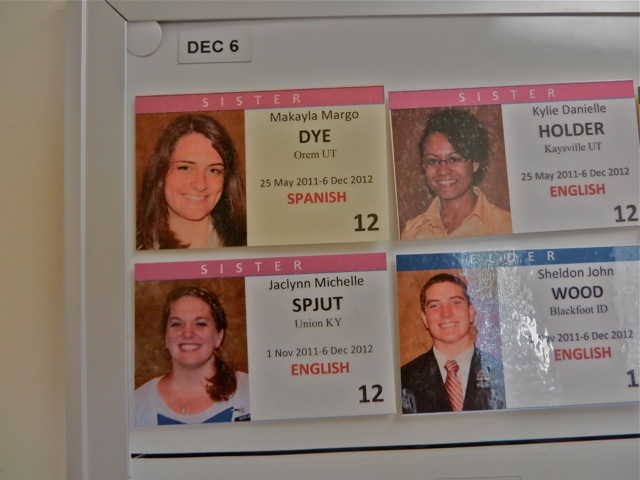 Since Sister Dye will be on her last transfer she now leads the board. Like all good missionaries she is sad about leaving the mission in December but she is also determined to make this last 6 weeks her best. Sisters Dye, Stegelmeier, Andrus and Johnson point to their pictures on the board. Sister and Andrus wanted a picture of the two of them. 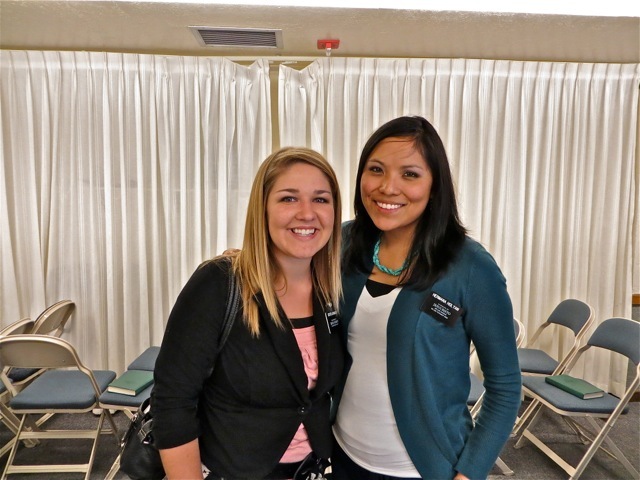 Sisters are very special missionaries and we hope to be here when the first 19 year old sister comes into the mission. If we can not be here we hope to at least know her name and when she will come. 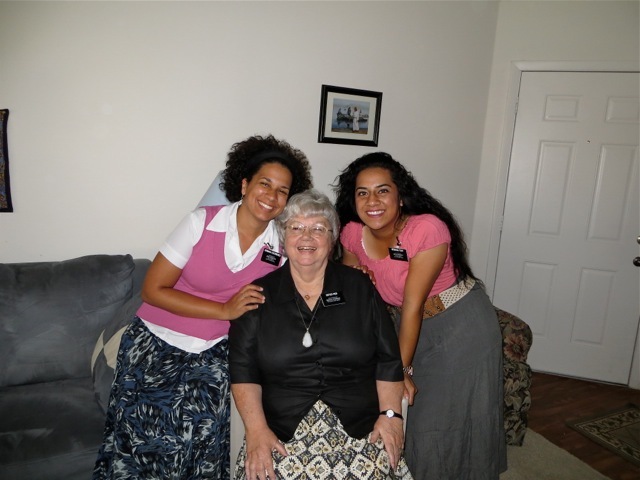 Sister Dye asked if we were sad when we left our first two missions and I told her not really because we knew it was time for us to leave and we had already planned when we would go on our next one. 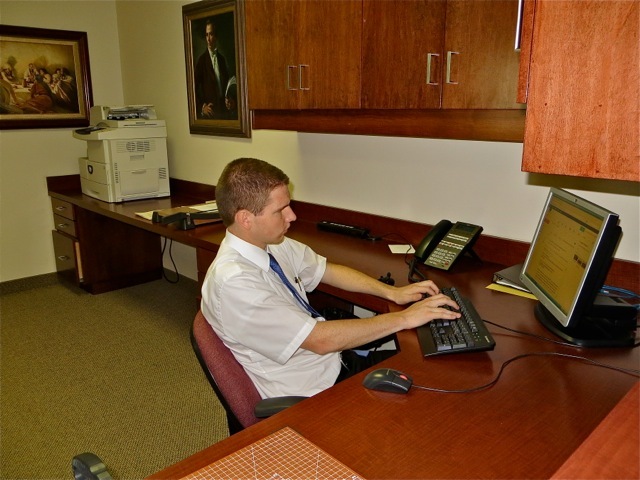 That is the advantage of being senior missionaries…you know that as long as your are physically and financial able, you can continue to serve the Lord by going on another mission. 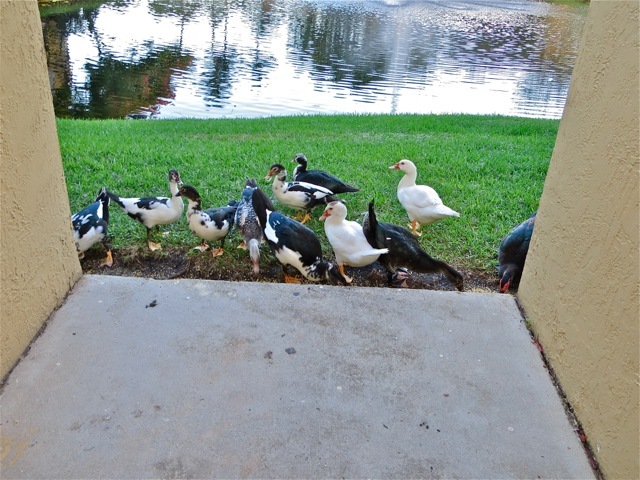 This entry was posted in Fort Lauderdale Mission on October 18, 2012 by Bill. 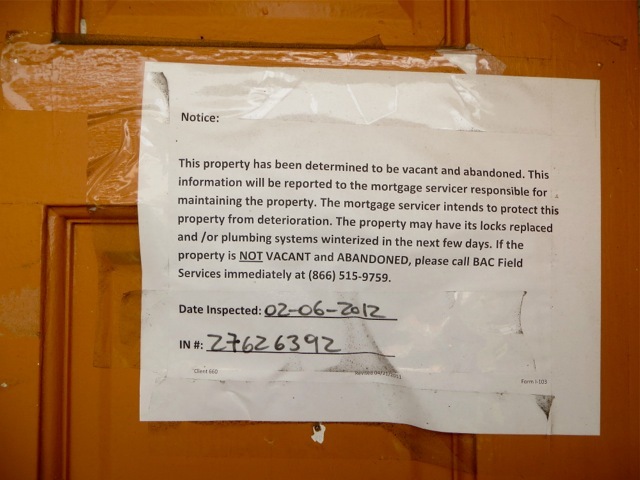 This entry was posted in Fort Lauderdale Mission on October 17, 2012 by Bill. 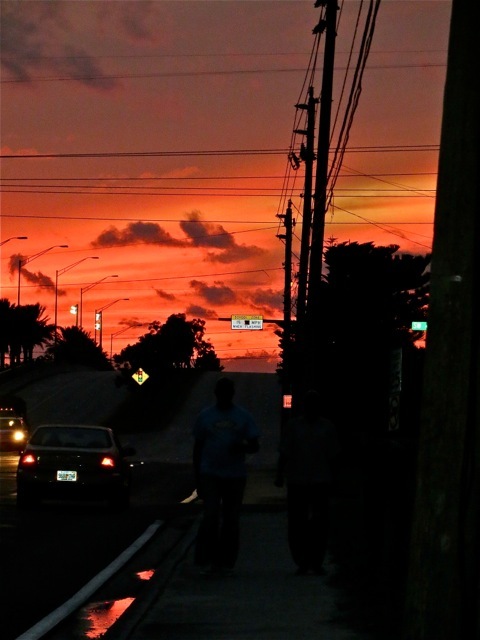 A Week ago Wednesday we were coming home from the Fort Lauderdale Ward mission correlation meeting and saw this beautiful sunset before us. The problem was finding some where to take a picture without having too many wires, buildings and other things in the way. This was the best I could do. The middle picture is a sunrise from our apartment. We get lots of beautiful sunrises and sometimes we even take the time to enjoy them. I like the end picture because of the reflection in the lake and the serenity of the scene in general. District meeting is on Tuesday and we always enjoy it. 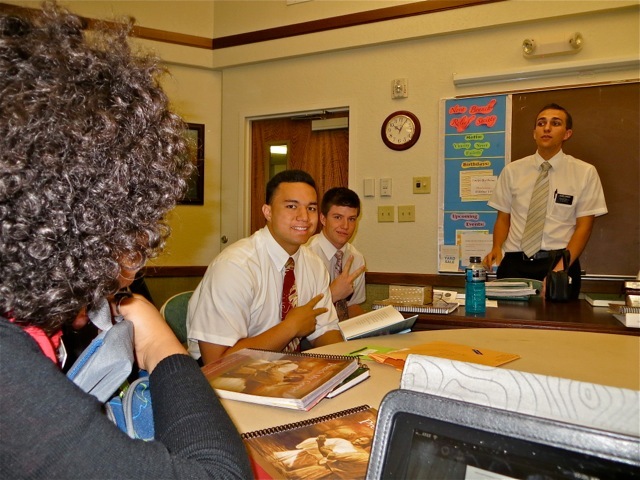 The picture on the right shows elders Rellaford, Doman, Patino, and Pond studying. Elders HoChing, Bishop and Conger are in the middle. Can you pick out who did not know they were having their picture taken? In September this district had more baptisms than some zones. They understand Faith + Obedience + Hard Work = Miracles. 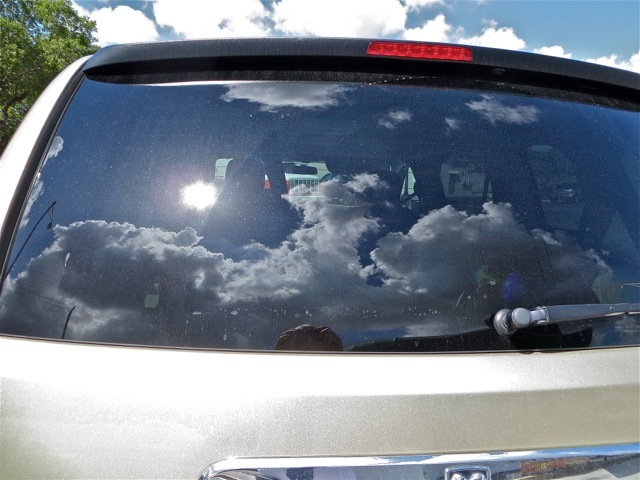 On our way back to the office after the meeting we stopped at Subway and I noticed how the sky was reflected in the large back window of this SUV. The cloud formations in Southern Florida are always changing. On Sunday we picked up an investigator at this building. The sign was on the door of the apartment next to them. There are too many of these kind of notices in Southern Florida. 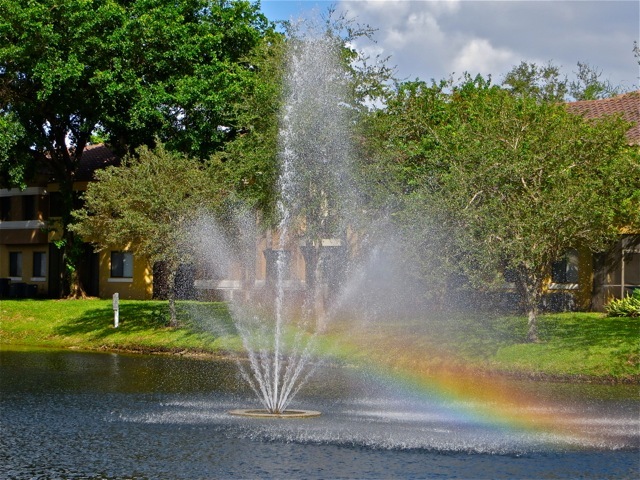 Rainbow at the lake – The Ducklings are starting to fly – A lizard took up residence in our garden art. 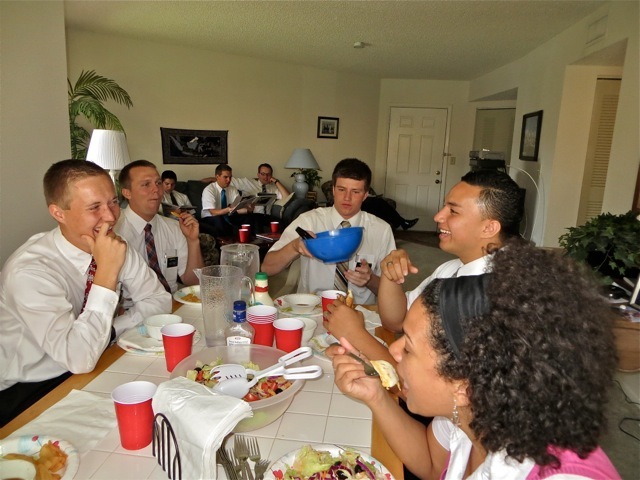 Yesterday – Wednesday – was the Train the Trainers meeting at the mission home and afterwards all the new missionaries and their trainers come into the office to pick up supplies, find some snacks and turn in baptism reports. I caught Sister Dougal coming out of the supply room. 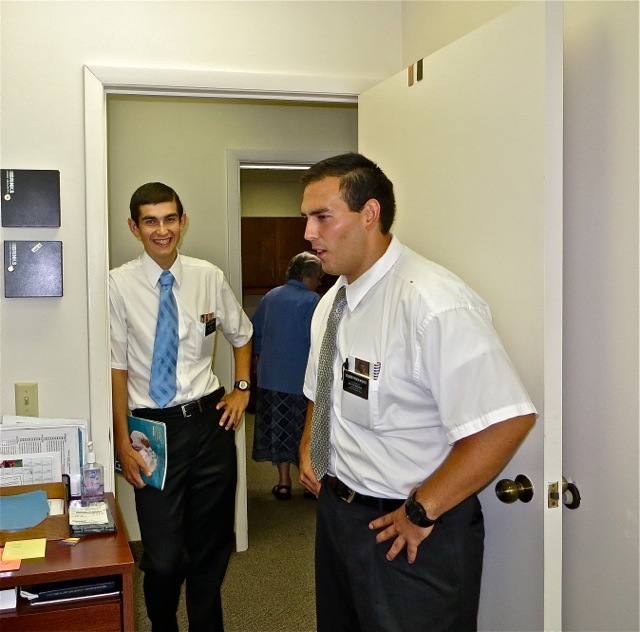 All missionaries when they visit the office have to spend some time checking out the departure board that shows all the missionaries and when they are going home. 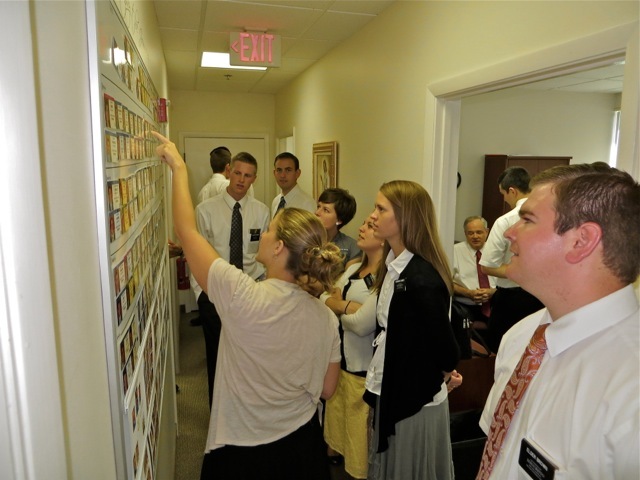 Among those shown are the two elder Browns, sisters Lake, Daines, Spujt and Dougal and others are finding where they are on the board and where friends are. 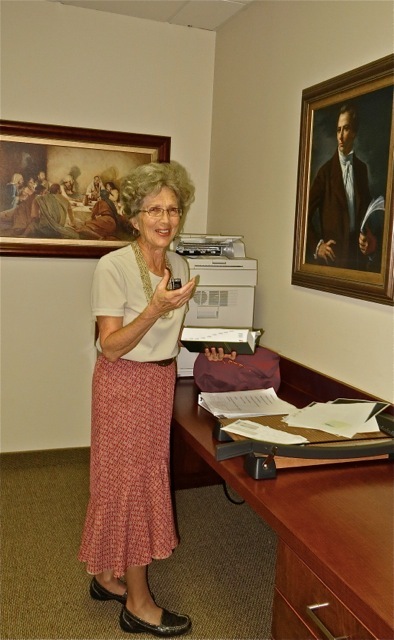 Sister Sommerfeldt is the mission nurse and is kept very busy trying to make sure that any of the missionaries who are ill or injured are on the road to recovery. 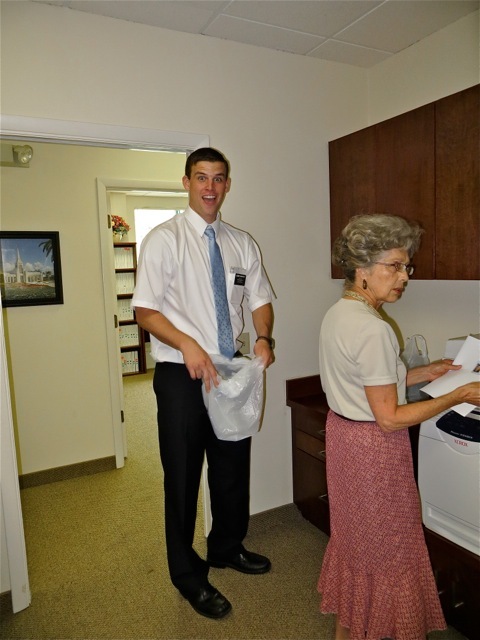 Elder Olson is smiling at elder Rockwood, elder Langford – who is really tall – is loading up some of the supplies they need behind sister Sommerfeldt – while elder Bare is trying to figure out his calling as the new car czar – I mean vehicle coordinator. 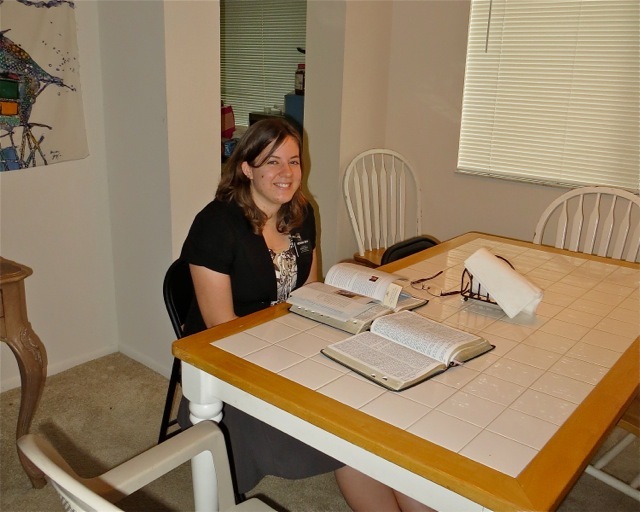 I can never get a good picture of sister Bare working because she is always in the corner trying to figure out what the missionaries were trying to write on the baptism and confirmation form. 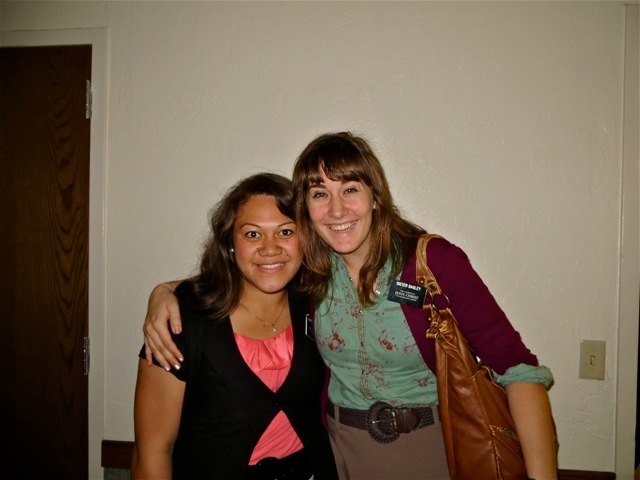 With the mission being on fires she is happy to get 25-45 new baptisms to record each week. 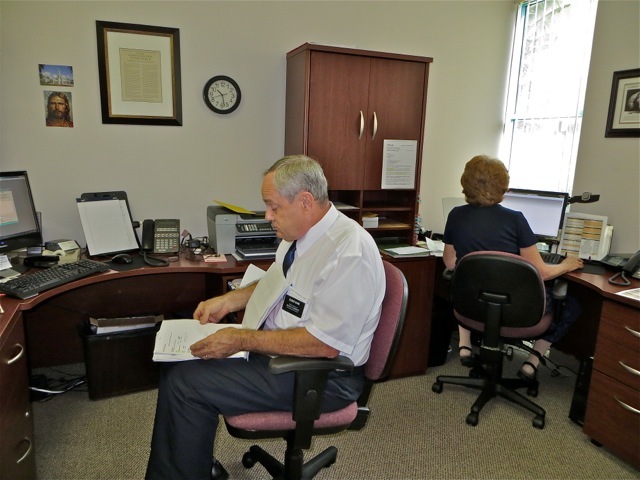 We look forward each Sunday or Monday for President Anderson’s weekly letter to the missionaries. 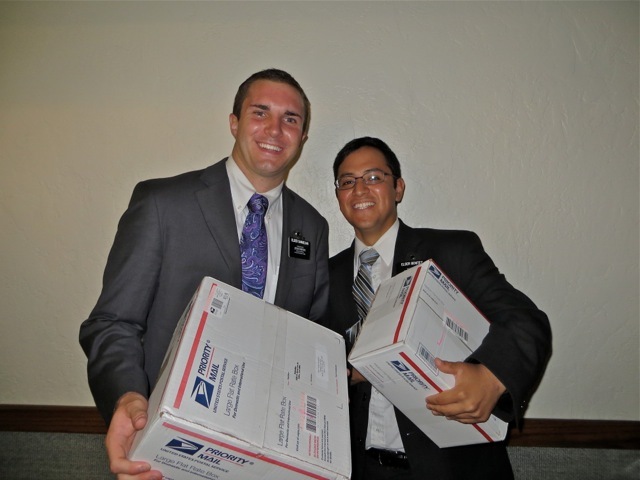 He gives encouragement, shares insights from the scriptures and talks, and always includes two or three spiritual experiences from the letters he receives each week from the missionaries. 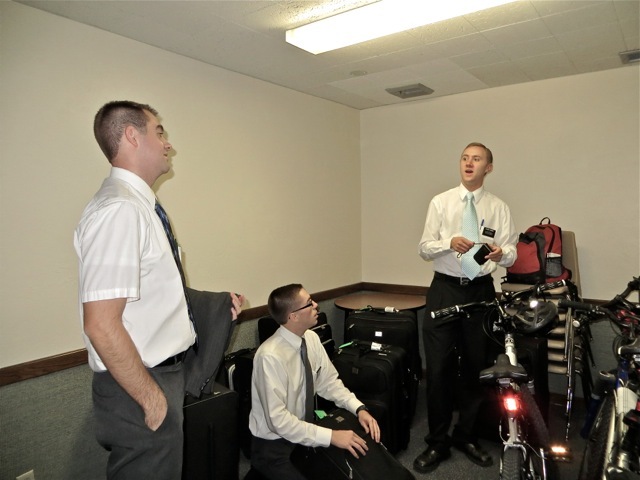 This entry was posted in Fort Lauderdale Mission on October 15, 2012 by Bill.